New way of doing taco night! Thank you TheWaytoHisHeart for sharing this amazing recipe! I love the traditional “taco night” possibly more than the average person. However, I’m always up for trying new recipes and this modified taco night was something I could not pass up! The recipe is easy enough and I will definitely be making more of it! Basically you brown ground beef- add taco seasoning and the secret ingredient, cream cheese! Cook the noodles, then stuff them with the beef mixture. Coat the bottom of a pan with a cup of salsa and lay the stuffed shells on top. put a little but of taco sauce over the stuffed shells. Now bake in the oven at 350 for 30 minutes. 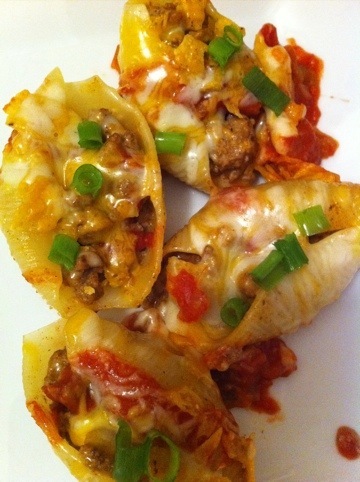 Take the pan out and sprinkle Monterey jack and cheddar cheese over the shells. Bake for an additional 15 minutes and voila! You are ready to “wow” your guests, or yourself, with an incredible meal:) enjoy!! HAHAHAHA, your header picture is the best! Now, this is definitely a different kind of taco, and it looks delicious—the amount of colours’ crazy! Glad you liked it! Definitely mixes things up a bit.